An acrobat virtually needs all the skills to be effective, however my thoughts about why to max some skills or why to take other skills is explained below. TWIN SHOT - Max it. It is the skill you spam the most, both in PVP and PVE. Each level increases the range of the skill, so you can use it from farther away. A twin shot +damage heraldry is recommended. TUMBLE , URGENCY TRICK & AERIAL EVASION - Max them. An acrobat relies on evasion skills. They should be maxed, no questions asked. MULTI SHOT - Max it. 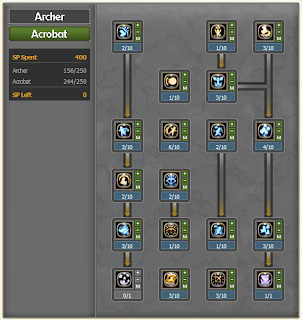 As your attack rises, multi shot also does a lot of damage, both in PVP and PVE. 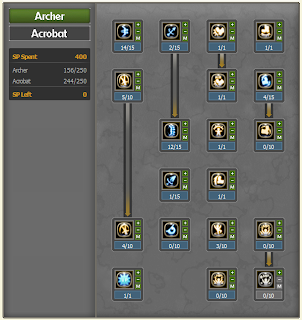 I think that it's the best skill where to spend your SP in the Archer part. 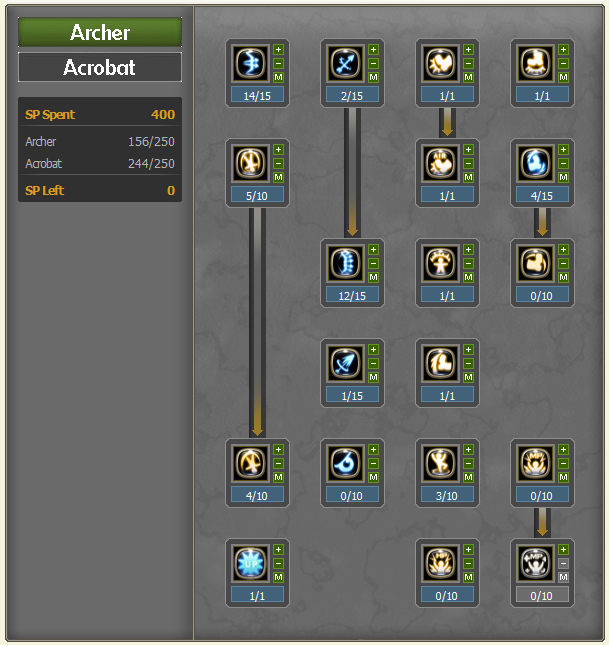 MAGIC ARROW - Lv1. Some people would say "Almighty you noob, why would an acrobat need magic arrow?" Well, in PVP, when you have an opponent on the ground and all your skills are on cooldown, magic arrow can help you to continue your combo and enable you to finish off your opponent. Not being able to continue your combo means death, so you need every skill available. Also, in PVE, it is useful against enemies like skeletons, because it doesn't break them up, even though the damage is low. SPIRIT FLAME: Lv 1. That skill is pretty useful to shoot from afar; it also can knock down your opponent. NEBULA CHAINS & SPINNING TOPS: Max them. A Nebula Chains cool down heraldry is also recommended to further reduce cooldown. Those two are very important evasion skills, you use them as often as possible. CIRCLE SHOT & ROTATING ARROW DISSIPATION: Get them. Both of them. I have heard some people say that they want to skip circle shot, and frankly I think that those people have no idea of what they're saying. Circle shot enables you to dodge virtually all the skills in PVP, and knocking back your opponent. Rotating arrow dissipation can help you recover when your other evasion skills are on cool down. SHORT BOW MASTERY: Max it. Damage and range is always good. SPIRAL EDGE. As for ultimate skill, I would recommend to take this one. The casting time is really short, and it does great damage in a single blow. The astral illusions ultimate takes ages to finish, and even though you are invulnerable, it is still not as flexible as spiral edge. The cooldown is longer too. SPIRAL VORTEX: Max it. It doesn't take that much SP and the damage increase is noticeable.